This altered book Christmas tree is very easy to make from an old paperback novel. The method used to make it is very similar to this Paperback Snowman and Paperback Pumpkin. Choose a paperback book with a strong spine and remove the covers. Slice the spine with a sharp knife to separate the first 30 pages. This will make the first half of the tree. Begin folding the pages, as shown in the Photo 1, at right. First, fold the top right corner toward the spine to form a right angled triangle. Fold the triangle toward the spine again, as shown in Photo 2. The bottom edge of the page will overhang the bottom of the book. Fold the overhanging triangle at the bottom of the book back up to form a straight line along the the bottom of page, as shown in Photo 3. Repeat with all thirty pages and set aside. Use the knife to slice another 30 pages from the book. Turn this section so the spine is on the right, rather than left. Repeat the steps above to create a mirror image. 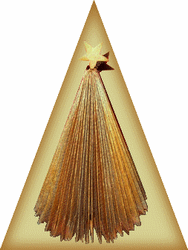 Glue the two halves of the Christmas tree together and add a wooden star at the top. Spray paint the tree all over. You may need two or three coats for complete coverage. Hi,Ellie, I’m sorry you feel that way. This is an older project and the photos are a little small. When I find time, I’ll try to replace them with larger pictures and perhaps that will help.